A whole week has flashed by in Pangkor. We began by satisfying ourselves that the sealift here definitely would not be able to lift and place Scott-Free on the hard. 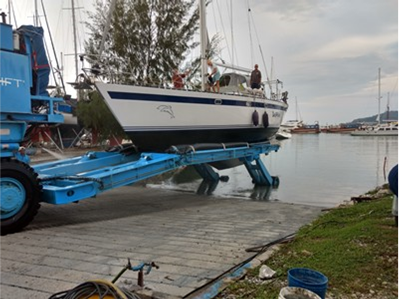 We will need to press on to Langkawi as planned to get the boat hauled. We found and tried a couple of cafes near the ferry terminal, sampled the cold beer at the nearby bar where we sat overlooking the beach for sundowners, and took a ferry ride over to the main town of Pangkor Island to get some money from the nearest ATM. The haulout ramp and sealift at Pangkor – not for us sadly. 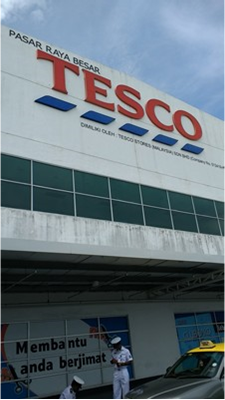 A familiar sign – Tesco supermarket! 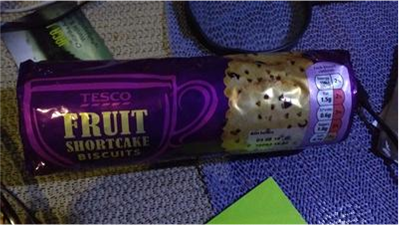 Steve indulged in a packet of his favourite biscuits. 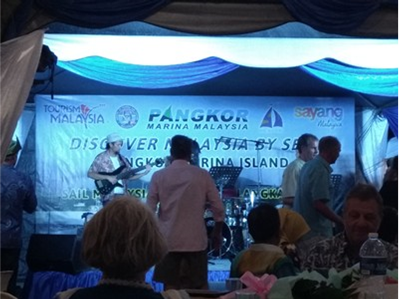 James Koo, the Marina manager, and his staff laid on a very enjoyable barbecue evening for the Rally, with plenty of beer, and organised a tour of Pangkor Island, a ferry trip across the water from the Marina. Dancing to the band at the Rally barbecue. 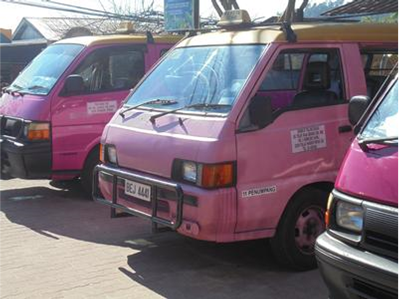 A fleet of pink taxis waited at the ferry terminal to take us around Pangkor Island. 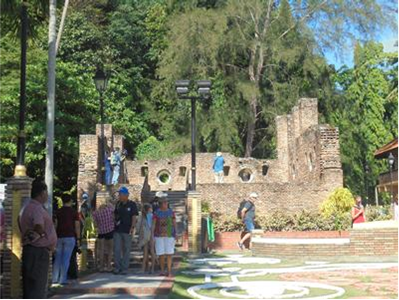 We visited a ruined fort built to protect the island from invasion, and a brightly painted Temple. 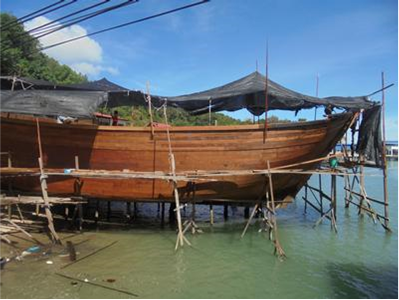 At a local boatyard, a traditional working boat under construction. 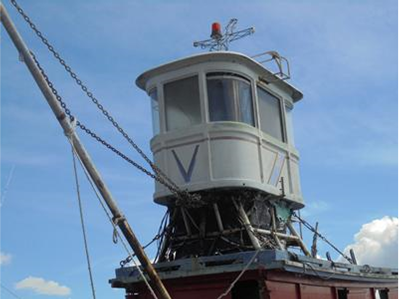 A closer look at the strange ‘cab’ on top of a fishing boat. 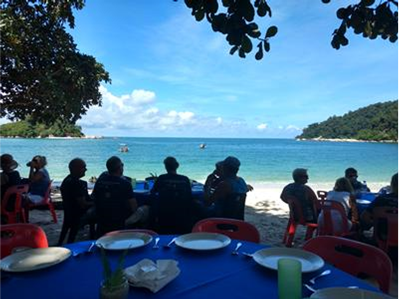 At lunchtime on the island we were dropped off at a beach restaurant where we sat at the water’s edge and enjoyed a many-course meal of typical Malaysain dishes, all paid for by James. It was nice to meet his wife and children who joined us at our table and with whom we enjoyed an interesting conversation about life in Malaysia. 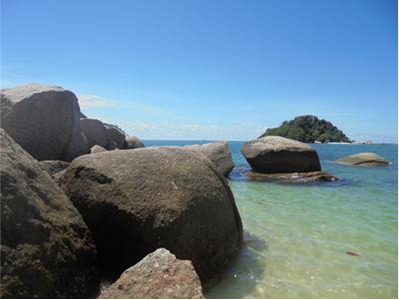 A long, leisurely lunch in a quiet, picturesque bay on the west side of Pangkor Island. 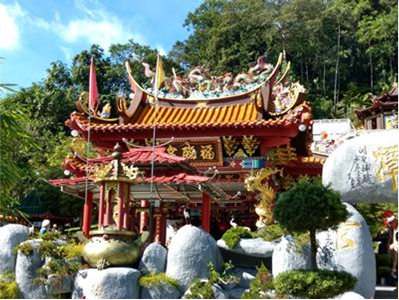 Of course we also spent some time on boat jobs and in researching and planning our road trip to the Cameron Highlands, a few hour’s drive inland from Pangkor. We have moved the boat to her own berth where she will be more protected while we leave her for a few days. Tomorrow morning we’ll collect the hire car from Reception, and then we are off!